This article was originally a presentation held at a meeting of the Society of Reformed students (Vereniging van gereformeerde studenten) in Leiden, 19 October 1989, and published in Dienst 37, no. 5 (Sept.-Oct. 1989): 17-32, with the title: “De plaats en de betekenis van de ambten in de gemeente van Christus.” The english translation first published in Diakonia 4, no. 2 (Dec. 1990): 31-38. Translation revised and corrected by A.J. de Visser in 2010 for use at the Canadian Reformed Theological Seminary. First, there is the clerical view of office which proceeds from the idea of apostolic succession and the sacrament of ordination. This view is held by the Roman Catholic Church and the Church of England. Second, there is a charismatic view. In this case the Spirit-endowed, religious individual holds central place. We find this view in congregational and Pentecostal churches. Third, a sociologically oriented view is becoming more prominent. In this case the congregation is seen as a religious group that needs leadership, like any other community. Office-bearers are appointed by the congregation for the purpose of preserving its unique character. This view is being proposed in publications from Dutch Reformed (“hervormde”) and “synodical” Reformed background. Then there is the Reformed view of the offices as it functions in our Reformed churches and is expressed in our Confessions and in our Forms for Ordination. It is this view that I would like to discuss. It is my intention to show how our reformed view is founded on the Scriptures and how in this view the intentions of the Holy Spirit are reflected in an excellent way. The Reformers defended the principle of Sola Scriptura. They intended to fully honor this principle as they reflected on the place of the offices in the church of Christ. Reformed church polity aims to give the Word of Christ the King full authority in his church. In order to gain a proper perspective on the functioning of the ecclesiastical offices, we must begin by taking into account the structure of the congregation according to the New Testament. In the old dispensation the structure of the congregation was determined by representation: Priests and Levites represented the people before God. In the sanctuary they acted on behalf of the people. It is significant that the priests were called ‘those who approach the LORD’ (Ex. 19:22). They alone were designated by the Lord to approach Him and to serve in His holy presence. In the new dispensation the structure of the congregation is characterized by participation. Office-bearers do not function as mediators and they do not represent others anymore. Everyone has access to the Father (Eph. 2:18), everyone may enter into the heavenly sanctuary (Hebr. 10:19). The Spirit does not rest on special individuals anymore. The whole congregation shares in the gift of the Holy Spirit (Acts 2:16-18; Rom. 8:15). In the congregation everyone is called to serve other members with the gifts he has received (Gal. 5:13). The apostle Peter exhorts believers: “Each one should use whatever gift he has received to serve others, faithfully administering God’s grace in its various forms.” (1 Peter 4:10) It is remarkable that many of the words which the New Testament uses to describe the work of office-bearers are also used to describe the ministry of believers towards each other. This illustrates that office-bearers do not have a monopoly on exhorting, correcting, comforting and helping others. The congregation is called to admonish (Matt. 18:15), to exhort (Hebr. 3:12, 13), to encourage (1 Thess. 5:14), to teach (Col. 3:16), to help (Gal. 6:10; Matt. 25:31-36). In Ephesians 4:16 the apostle Paul underscores the responsibility of each member with respect to the growth of the body. Even though the structure of the congregation is characterized by participation and activity, it does not follow that the responsibility for its upbuilding and growth is left solely to the mutual care of the members. In Ephesians 4 Paul begins to speak about the charismatic congregation in which grace has been given “to each one of us” but he immediately continues to draw attention to the work of office-bearers. It is important to note that, according to Paul, the congregation does not give itself its office-bearers. It is not the congregation that calls offices into being because it realizes that leaders are needed to keep the congregation close to the Word of Christ and to remind the believers of their calling.In Ephesians 4:11 Paul points to Christ and writes: “And he gave the apostles, the prophets, the evangelists, and the pastors and teachers.” (ESV) The word “and” here has the meaning of “as well” or “in addition.” Besides the many gifts of grace or charismata, Christ has given office-bearers as well. The words “he gave” suggest that the gift of office-bearers was intended to an abiding characteristic of the structure of the Christian congregation. The offices are as much part of the structure of the congregation as the charismata. In Acts 20:28 we read that Paul tells the elders of Ephesus that the Holy Spirit has made them overseers of the flock of Christ. This Spirit is the Spirit of Christ (Acts 16:7), the Spirit of Him who feeds his congregation and cares for it (Eph. 5:29) and who is always with her to the very end of the age (Matt. 28:20). The implication is that we may say that it is Christ who, through his Spirit, appointed elders for the church of Ephesus as overseers. The fact that the congregation has office-bearers does not rest on a pragmatic basis, nor can it be ascribed to human invention. Rather, it must be ascribed to the care of Christ. The office is not from below, from human origin, but from above, from Christ. For this reason it is completely correct that the forms for ordination in the Book of Praise begin by pointing to Christ who from heaven gives office-bearers to His congregation. That it is Christ who gives office-bearers does not mean that the congregation is totally uninvolved in the process of appointing office-bearers. Office-bearers are not being dropped from heaven into the congregation. Even during the ordination process the Christian congregation has a responsibility as an active congregation that shares in the gift of the Holy Spirit. This was different in the old dispensation when the Lord Himself determined who were to serve in office. Israel did not play a role in this. But the outpouring of the Spirit had implications for the way that leads to office as well. In the book of Acts we see how the congregation is involved whenever the need for office-bearers arises. In Acts 1:12-26 we read about the election of Matthias as apostle. To be sure, the process was directed by office-bearers. The apostle Peter explained what the requirements were for the new apostle. But he addressed the “brethren,” the congregation. The apostles did not simply fill the vacancy, they involved the brothers. We should note that “the brothers” nominated two men as candidates. This led to Matthias being chosen by the casting of lots. In Acts 6:1-6 we discover that the congregation was even more involved with the appointment of office-bearers. Again, office-bearers were overseeing the process. The twelve apostles called the disciples together, explained the situation, and suggested that seven brothers be chosen. They also formulated the qualifications for these office-bearers. The congregation was actively involved. They were asked to look for suitable brothers. Next the election took place. Finally, the congregation “presented” the elected persons to the apostles. In Acts 14:13 we read that Paul and Barnabas “appointed elders” in each congregation. This does not mean that the congregation was not involved. The believers prayed and fasted (verse 23b). Clearly, they were involved with the appointments. Moreover, the word “appointed” is probably a short-hand term used by Luke to summarize the whole process. The way the apostles directed the process of appointing office-bearers, as described in the book of Acts, was taken as prescriptive for the later church by Bucer and Calvin. Rightly so. It was not just as ear- and eye-witnesses that the apostles laid the foundation of church. They also did this by the way they gave direction to the apostolic church. Their conduct (2 Tim. 3:10) has normative value for the church of all ages. Paul’s exposition in 1 Corinthians 12 makes it clear that someone’s place in the congregation is based on the gift of grace, the charisma, which the person has received. This applies to office-bearers as well (verses 28f.). Paul exhorted Timothy not to neglect the charisma he had received but to fan into flame the gift of God which was in him (1 Tim. 4:14; 2 Tim. 1:6). 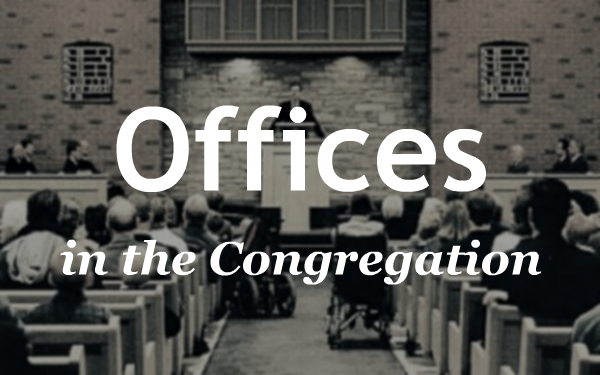 The office provides the mandate and the opportunity for someone who has received gifts through the Spirit of Christ, to use these specific abilities in an institutional service for the upbuilding of the congregation. This does not mean that all the work in the congregation has to be done by office-bearers. According to the New Testament the whole congregation is called to serve and to use its gifts. In 1 Corinthians 12 the apostle Paul explains that the members of the body must serve one another. He also writes: “To each one is given the manifestation of the Spirit for the common good” (verse 7). Hence, the purpose of the work of the office-bearers is not to take work out of the hands of the congregation but rather to stimulate the congregation to engage in a variety of mutual service. One could say: Office-bearers serve in order that the congregation may (begin to) serve. Paul clearly identifies this purpose of the work of office-bearers in Ephesians 4:12. Christ has given office-bearers “to equip the saints for the work of ministry, for building up the body of Christ.” The exegesis of this verse has been much debated. Older exegetes thought that Paul points to a threefold purpose of the work of office-bearers: They must first of all equip the saints, then do the work of ministry, and in the third place build up the body of Christ. This interpretation has been discarded in our days. The main objection against it is that in verse 16 the upbuilding of the body is viewed as a calling of all believers. The best explanation is this: Paul intends to say that office-bearers are given in order to equip the saints. This ‘equipping’ is done with the aim that the saints themselves would take part in ministry. And the purpose of this ministry by the saints is the edification of the body. The Greek word which is used by Paul to describe ‘equipping’ means to give someone something by which the person will be able to fulfill his purpose and fully use his abilities. It is thus the task of the office-bearers to equip the believers in such a way that they will be able to function as members of the body according to the calling which they have received. The saints are called to serve and in this way the body will be built up. Christ gives office-bearers to equip the saints to do so. In Ephesians 4:16 we hear even more about the task of the offices. Paul uses imagery in which medical terminology is prominent. He refers to a body that is being held together “by every supporting ligament.” The Greek word which Paul uses for ‘ligament’ points to the muscles and tendons in the body. With J.H. Roberts we assume that with this terminology Paul is pointing to the office-bearers. Tendons hold the body together and give it firmness. This points to the coordinating task of the offices. The office-bearers are given to the congregation to coordinate the use of spiritual gifts. In the congregation we should not work against each other or in separation from each other. Coordination helps to prevent disorder and to maintain peace in the body (1 Cor. 14:33). Everything is geared towards the upbuilding of the congregation. In our churches we recognize three offices. Article 2 of our Church Order stipulates: “The offices are those of the minister of the Word, of the elder, and of the deacon.” However, if we read the New Testament we come across a multitude of official and non-official positions. In the book of Acts we find “the seven” (Acts 6:3; 21:8), the “evangelist” (Acts 21:8), the “prophet” (Acts 11:27; 13:1), the “teacher” (Acts 13:1), an “apostle” who did not belong to “the twelve” (Acts 14:4, 14), “elders” in Jerusalem (Acts 11:30; 15:6) and “elders” who were appointed in the various local congregations (Acts 14:23; 20:18). In the letters of Paul we find references to brothers “who teach” (Gal. 6:6), who are “over you in the Lord” (1 Thess. 5:12), and pastors and teachers (Eph. 4:11). The apostle also refers to gifts of helping and administration (1 Cor. 12:28) and gifts of serving, encouraging, leadership and showing mercy (Rom. 12:7, 8). The same apostle mentions also overseers and deacons (Phil. 1:1, 1 Tim. 3). In the epistle to the Hebrews we find a reference to “leaders” (Heb. 13:7, 17). Our Church Order recognizes three offices but this is not a number that is etched in stone as a matter of principle. The old Church Order of Dordrecht (1618-1619) recognized four offices: apart from the well-known three there was also the office of ‘doctor’ or professor of theology (see art. 19 C.O.). To the Reformers of the sixteenth century the number of offices was not a major issue. They reasoned that the church should have as many offices as are needed for its edification. That was the main thing. The architects of the Reformed doctrine concerning the offices, Bucer and Calvin, emphasized the importance of the offices of elder and deacon. This is in accordance with the New Testament. In the apostolic church we see the emergence of elders as office-bearers who have pastoral supervision over the congregation. Paul and Barnabas appointed elders in all the churches (Acts 14:23). Paul wrote a letter to all the saints at Philippi “with the overseers and deacons” (Phil. 1:1). It is significant that the apostle mentions the overseers and deacons in his salutation. In 1 Timothy 4:14 we hear about a “body of elders” which apparently gave leadership. Furthermore, in 1 Timothy 3 Paul describes the requirements for elders and deacons. In conclusion we may say that, although we see a variety of official and unofficial ministries in the New Testament, the offices of the elder and the deacon appear to have a more permanent character. Article 2 of our Church Order mentions the offices of minister of the Word, elder and deacon. In the articles 16, 22 and 23, we find their ministries described in more detail. We have to admit that these three offices, as the Church Order speaks about them, cannot directly be traced back to the New Testament. The minister (“dominee”) as we know him did not exist in the apostolic church. The Form for Ordination of Ministers of the Word refers to I Timothy 5:17 and reads (with Calvin) that there were two kinds of elders in the apostolic church: elders who ruled and elders who were, in addition, called to labor in preaching and teaching. The Form cautiously comments: “The latter are now called ministers of the Word.” Indeed, the quoted text passage does not deal with two kinds of elders but with the difference in intensity according to which brothers can serve as elder. There are some who toil and labor and devote much time and energy to teaching and doctrine. Among the elders there are full-timers and part-timers. The same applies to the elder as we know him today: We do not find our elder back in the New Testament exactly the way he functions today. In the apostolic church all elders were teaching elders. From Acts 20:28-31, 1 Timothy 3:2, 1 Timothy 5:17, and Titus 1:9, it appears that elders had a shared responsibility in feeding the congregation with the Word.With respect to the deacons it is difficult to reconstruct how they functioned within the apostolic church. In 1 Timothy 3 the apostle Paul describes the requirements for deacons but he does not explicitly describe their mandate. Indirectly we are able to deduce that they were involved with the ministry of mercy. The three offices as we know them in our Church Order should be understood against the historical background of choices and decisions made during the time of the Reformation. For example, that the Reformers viewed the office of the minister of the Word as a distinct office is obviously connected to the central importance which the preaching of the Word of God had in their view. They also put special requirements in place, such as academic instruction and the ability to read the Word in the original languages. Similarly, the fact that in Reformed church polity the deacon is a member of the church council is the result of decisions made in the past. The deacon’s right to be a member of the church council is not based on what the New Testament says about his mandate. It is based on an authority that is granted by the churches. In our churches the three fundamental ministries that we recognize in the New Testament, have developed into three distinct offices. First of all, we have the office of minister of the Word. According to Reformed church polity, the minister is an elder and together with the other elders he is responsible for the pastoral supervision over the congregation. However, his first task is to be responsible for preaching and teaching. The minister is a shepherd by way of being a teacher. He is called to proclaim the Word of God in the midst of the congregation. To that end he has received special training. If the minister is doing so many home visits that he does not have enough time for the core aspect of his mandate, a thorough re-evaluation of his work is needed! Wierenga maintains that we have ‘the great news’ in the Scriptures. Everyone can read it for himself. The minister’s role is merely to explain the text passage. He instructs the congregation in how to read the Bible. Wierenga writes: “The Bible is a very informative text in every respect… many people need lots of explanation, clarification and application, etc., in order to be able to understand the text fully. To that end a well-trained person (M/F) is needed who has the intelligence, wisdom, emotionality and competence – philologically, exegetically, communicatively and socially – to help the congregation understand the Bible. That is what a ‘sermon’ is.” Wieringa feels that from a salvation-historical perspective concepts such as “administration of the Word,” “proclamation” and “preaching,” are outdated and should no longer be used. I do not share this view. Even though the apostles had proclaimed the great news and the apostolic letters had been read to the congregations (Col. 4:16), we still find elders in the apostolic church “who labor in preaching and teaching” (1 Tim. 5:17). The apostle Paul charged Timothy to “preach the word” (2 Tim. 4:2). For ‘preaching’ the Greek uses kerussein which is used elsewhere to characterize the preaching by the apostles (Matt. 10:7; Mark 16:15; Acts 10:42; 20:25). In the apostolic church we also find teachers (Acts 13:1; 1 Cor. 12:28; Eph. 4:11) who taught the congregation and in so doing preached the Word in a special way. From these passages it becomes clear that the apostles were not the only ones who taught (Acts 5:42; 20:20; 1 Cor. 4:17). We also find prophets (cf. Acts 13:1; I Cor. 12:28; Eph. 4:11) who “utter mysteries” (1 Cor. 14:2). In Hebrews 13:7 we read about leaders who spoke the word of God to the congregation. When Paul in 2 Corinthians 5 writes that God “gave us the ministry of reconciliation,” he is not just referring to himself but also to Timothy (2 Cor. 1:1) as well as others who were mandated to preach and teach. In verse 19 Paul says that God has entrusted “us” with the message of reconciliation. It is impossible that this “us” would refer exclusively to the apostles, since in the apostolic church others were involved in proclamation, teaching and speaking as well. In Romans 10:17 the same apostle states that “faith comes from hearing the message.” Given the context it is clear that he refers to hearing the Word being preached. In 1 Corinthians 1:21 Paul writes that “God was pleased through the foolishness of what was preached to save those who believe.” None of these texts give any indication that what Paul is saying should be limited to the preaching of the apostles. What Paul writes has validity for all times. This is the way God the Holy Spirit works! All this evidence indicates clearly that it was not just the apostles who were engaged in the proclamation of the gospel. There were others as well who were mandated to labor in Word and doctrine. They did not give the congregation ‘reading lessons.’ Rather, they proclaimed, taught and spoke the Word. The Lord Jesus has said that in His name “repentance and forgiveness of sins will be preached to all nations” (Luke 24:47). When the apostles appointed office-bearers in the local congregations (Acts. 14:23), these brothers were elders who not only provided leadership, but also took it upon themselves to preach and teach (1 Tim. 5:17). This is in agreement with the requirements for the overseer, which includes that he should be “able to teach” (1 Tim. 3:2). To be sure, the congregation has the Scriptures. But the Word needs to be proclaimed, taught and spoken time and again. In 2 Timothy 3:16, 17 the apostle Paul speaks very highly about the significance of the Scriptures. Immediately following that, he instructs Timothy, “Preach the Word…” (2 Tim. 4:2). In 2 Corinthians 5 Paul constantly interchanges “reconciliation” with “ministry of reconciliation.” It is clear that this ministry is the way in which salvation reaches the world and the congregation. To the apostle, salvation and preaching belong together. Dr. J. T. Bakker correctly observes: “Reconciliation has been accomplished for us. This means that it cannot be understood without its relation to humanity; it also means that preaching is part of reconciliation. The “for us” of reconciliation implies the kerugma, because the kerugma implies the divine work being aimed at us, being valid for us. With this in mind Luther and Calvin elevated preaching as the means by which the Holy Spirit makes us share in Christ and all His treasures. This conviction of the Reformers is reflected in the Heidelberg Catechism where we confess that the Holy Spirit “works” faith in our hearts (note the present tense!) “by the preaching of the gospel” (Heid. Cat., answer 65). Over against L. Wieringa I maintain that the preaching of the Word is a ministry which (as Calvin said) the church will always need and which requires its own office. The core task of the office of elder is pastoral supervision over the congregation. The elder has to keep watch over the flock (Acts 20:28), and shepherd it (1 Peter 5:2). He is an overseer (1 Tim. 3:2, Acts 20:28). In the New Testament these words all have a pastoral flavor. The office of an elder is a shepherd office. The pastoral supervision by the elders is mainly carried out by way of regular visits. When the elders visit the members in their homes, they do not come as inspectors but as shepherds who keep watch over their sheep. We may rightfully say that elders are “administering the Word” for it is with the Word that the sheep are fed. The difference between the elder and the minister of the Word is that the elder administers the Word privately, in the homes, not publicly, in the gathering of the congregation. The core task of the office of the deacon is helping, especially in cases where no help is being given (yet). The deacons also are to see to the good progress of the service of charity to which the church is called. The Form for Ordination adds that deacons are called to encourage and comfort with the Word of God those who receive the gifts of Christ’s love. The deacon administers the Word as well! But this ministry has its own focus: The deacon lets the light of the Word shine in situations of need in which members of the congregation find themselves. During diaconal home visits the deacons administer the Word of God by exhorting the members of Christ’s body to show mercy to one another. The focus of the administration of the Word by the deacons is more limited than that of the elders. The elders are called to let the Word shine over all aspects of the congregation’s life. The office in the church has a servant character. It concerns itself completely with diakonia to the Word of Christ. W.D. Jonker correctly comments: “It is not because someone holds office, but because and insofar as he is a bearer of God’s Word and an instrument in the service of the Holy Spirit, that his work has authority for the congregation. In other words: According to the New Testament the authority of the office-bearer is a derived authority, a material authority, that completely depends on how the gospel is being served by it.” When an office-bearer does not serve or administer that gospel, he has no authority whatsoever. Because an office-bearer must be no more than a servant of Christ, and since all his actions should be determined by His Word, the obedience to which the Scripture call us is always a Biblically-discerning obedience, not a blind kind of submission. Paul exhorts believers not to treat prophecies with contempt but he immediately adds that they should test everything and hold on to the good (1 Thess. 5:20, 21). Paul says that those elders who direct the affairs of the church well are worthy of double honor (1 Tim. 5:17). The congregation must remember the leaders “who spoke to you the word of God” (Hebr. 13:7). The congregation must constantly test the ministry of the office-bearers, which means testing it according to the magna charta of the office: the Word of Christ. The office watches over the congregation but the congregation in turn watches over the office. For only Christ may rule in the Church. For this reason there should be a place for discussing the ministry of the offices in the relationship between office-bearers and members of the congregation. Office-bearers who do not want to hear any criticism are denying the fact that the congregation has received the Word and has been taught by God as well. The implication is that the congregation can and may take part in discussions regarding the work of the office-bearers. The constant prayer of the congregation is indispensable to all of this. It is striking how often the apostle Paul requests the intercession of the saints (Eph. 6:19; 1 Thess. 5:25). Ministers, elders and deacons cannot do their work well unless they are supported by a praying congregation. Originally a presentation held at a meeting of the Society of Reformed students (Vereniging van gereformeerde studenten) in Leiden, 19 October 1989, and published in Dienst 37, no. 5 (Sept.-Oct. 1989): 17-32, with the title: “De plaats en de betekenis van de ambten in de gemeente van Christus.” English translation first published in Diakonia 4, no. 2 (Dec. 1990): 31-38. Translation revised and corrected by A.J. de Visser in 2010 for use at the Canadian Reformed Theological Seminary. cf. A.F.N. Lekkerkerker, Oorsprong en funktie van het ambt, (‘s-Gravenhage, 1971); W.D. Jonker, Als een riet in de wind… Gedachten naar aanleiding van de huidige discussie rondom het ambt (Kampen, 1970). I have borrowed this from J. P. Versteeg, Kijk op de kerk. De structuur van de gemeente volgens het Nieuwe Testament, (Kampen, 1985), p. 20. On charismata in the New Testament see U. Brockhaus, Charisma und Amt. Die paulinische Charismenlehre auf dem Hintergrund der frühchristlichen Gemeindefunktionen, (Wuppertal, 1972), p. 128. cf. also H. Greeven, Die Geistesgaben bei Paulus, in: Wort und Dienst, Jahrbuch der Theologischen Schule Bethel als Festschnift für W. Brandt, Vol. 6, 1959, p. 114. cf. also C. Trimp, De gemeente en haar liturgie, Een leesboek voor kerkgangers, (Kampen, 1983), p.29. cf. also J. van Bruggen, Ambten in de apostolische kerk, Een exegetisch mozaïek, (Kampen, 1984), p. 144 f.
 cf. M. H. Bolkestein, Zielszorg in het Nieuwe Testament, (The Hague, 1964), p. 94.
 cf. Wat is er aan de hand met het ambt?, p. 40.
 cf. J. P. Versteeg, Geest, ambt en uitzicht, p. 72.
 cf. J. P. Versteeg, op. cit., p. 72.
 cf. Herman Ridderbos, De kerk ‘als instituut’, in Bewerken en bewaren. Studies aangeboden aan prof. dr. K. Runia, (Kampen, 1982), p.51 f.
 The Greek for appoint is cheirotomeo. It was primarily used for voting in the Athenian legislative assembly and literally means “to put up the hands.” Whether the word still has that meaning in Acts 14:23 is debatable. It can also mean “appoint.”; cf. Theologisches Wörtebuch zum Neuen Testament, IX, (Stuttgart, 1970), p. 427.; F. W. Grosheide, De Handelingen der Apostelen, (Kampen, 1942), p. 470 f.
 L. Wierenga, “’Paulus kon niet preken.’ Enkele opmerkingen naar aanleiding van “Bediening’ in de apostolische kerk,” (Radix 14, no. 4, 249 f.), loses sight of this. By ‘ecclesiastical office’ I understand a charisma that is recognized by congregation and consistory, and by means of a public ordination in Christ’s name is enlisted for the specific task of the edification of the congregation. The General Synod of Arnhem (1930) incorrectly called the election “an act of general governing authority.” The counter proposal which I, together with Dr. K. Deddens, made to General Synod Groningen-Zuid (1978) in connection with the so-called women’s voting right, describes the election as follows: “this election guided by the consistory is a communal act of both the consistory and the congregation, in which members of the congregation do not participate in the ruling of the church, but in which the consistory involves the congregation who, by virtue of her maturity reached at Pentecost, continually looks for the gifts necessary for the office.” (Acta van de generale synode van de Gereformeerde Kerken in Nederland, samengekomen te Groningen-Zuid op Dinsdag 11 April, 1978, Haarlem, p. 149). Italics mine, A.N.H. cf. J. P. Versteeg, op. cit., p. 73. I follow J. P. Versteeg, op. cit., p.73. cf. J. H. Roberts, Die opbou van die kerk volgens die Efesebrief, (Groningen 1963), p. 139 f.
 cf. U. Brockhaus, op. cit., p. 7. cf. ; Herman Ridderbos, Paulus, Ontwerp van zijn theologie, (Kampen, 1966), p.490 f.
 cf. H. Freiherr von Campenhausen, Kirchliches Amt und geistliche Vollmacht in den ersten drei Jahrhunderten, (Ubingen, 1963), p.59 f.; E. Käsemann, Exegetische Versuche und Besinnungen, I. (Groningen, 1960), p. 128 f.
 J. P. Versteeg, Kijk op de kerk, p. 28. Regarding the ‘elders’ in Jerusalem, see J. Van Bruggen, op. cit., p. 46, 47. C. Trimp, Inleiding in de ambtelijke vakken, (Kampen, 1978), p.46, 47. Calvin speaks about three kinds of offices which Scripture recommends, and points out that the early church organized all offices in three ranks (ordines). (Institute IV, 4, 1). Quoted by A. F. N. Lekkerkerker, op. cit., p. 18. For the office of doctor with Calvin see, W. F. Dankbaar, Hervormers en Humanisten, (Amsterdam, 1978), p. 153. W. van ‘t Spijker, De ambten bij Martin Bucer, (Kampen, 1987), remarks concerning Bucer: “It is incorrect to think that he only recognized four offices, that of preacher, elder, doctor and deacon. Bucer indeed mentions them. However, the number is irrelevant. There have to be as many as is necessary for the congregations and according to such a specialization that meets this need” (p.439). Calvin distinguishes “temporary” and “permanent” offices in the Apostolic church. The temporary ones are those of the apostle, prophet and evangelist. He, however, says with respect to the temporary offices, “and now and again [God] revives them as the needs of the time demand.” (Institutes, IV, 3, 4). J. van Bruggen remarks in connection with the term presbuterion: “In the oldest Christian idiom, the term is frequently used for the assembly of the local ‘elders’ or ‘presbyters.’ The use of this term in I Timothy 4:14 indicates that there has been a clear-cut group of specially appointed people in each city from the beginning: they, as elders of the congregation, together formed a senate or council.” (op. cit., p. 95). J. van Bruggen, op. cit., p. 102, gives further argumentation. cf. J. P. Versteeg, “Nieuwtestamentisch profiel van de ouderling”, in: D. Koole en W. H. Velema, Uit liefde tot Christus en Zijn gemeente. Een handreiking aan de ouderling, (Kampen, 1982), p. 51. A. N. Hendriks, Met het oog op de gemeente. Populair-theologische bijdragen, (Haarlem, 1987), p. 83, 84.
 cf. J. Kamphuis, Altijd met goed accoord, (Amsterdam, 1973), p. 136. C. Trimp, “Geen halve maatregelen,” De Reformatie, Vol. 64, pp. 967-968, gives suggestions for lightening the task of the minister. Especially the suggestion of the “elder freed of duties” deserves our attention. I remind you of the “full-timers” among the elders in the Apostolic church (cf. I Timothy 5:17). cf. L. Wierenga, ‘Paulus en de dwaze Galaten,” Radix, XIV, #1, p. 40. L. Wierenga, “Paulus kon niet preken”, p. 262. L. Wierenga, op. cit., p. 255. For the ‘prophet’ cf. J. van Bruggen, op. cit., p. 34.; Herman Ridderbos, Paulus, p. 503 f.
 cf. C. Trimp, De volmacht tot bediening der verzoening, (Groningen, 1970), p. 38; J. T. Bakker, op. cit., p. 16, 17. J. T. Bakker, op. cit., p. 18. For Luther see, Vilmos Vajta, Die Theologie des Gottesdienstes bei Luther, (1959), p. 134. For Calvin see, W. Krusche, Das Wirken Des Heiligen Geistes nach Calvin, (Gottingen, 1957), p. 220.; C. Veenhof, Calvijn en de prediking, in: J. van Genderen, Zicht op Calvijn, (Amsterdam, 1965), p.47 f.
 cf. H.M. Legrand, Onuitwisbaar merkteken en theologie van het ambt, Concilium, VIII, #4, p. 59 f. ; E. Schilebeeckx, ‘merkteken’, in: Theologisch Woordenboek, II, ed. H. Brink, (Roermond-Maaseik, 1957), p. 2145. ; See also C. Trimp, Ministerium. Een introductie in de reformatorische leer van het ambt, (Groningen, 1982) p. 46. Bucer says: “All authority… rests on the Word and Spirit of God.” Calvin says over against Rome: “This, then, is the difference. Our opponents locate the authority of the church outside God’s Word; but we insist that it be attached to the Word, and do not allow it to be separated from it.” (Institutes, IV, 8, 13). cf. K. Runia, “De dienstknechtsgestalte van het ambt,” in: De Dienstknechtsgestalte van Christus. Studies aangeboden aan prof. dr. H.N. Ridderbos, (Kampen, 1978), p. 194; A. A. van Ruler, Bijzonder en algemeen ambt, (Nijkerk) n.d. p. 76. W. D. Jonker, op. cit., p. 12, 13.